What is the worst arthritis? and what makes them worse? What is the worst arthritis? and what makes them worse? Arthritis is a group of conditions that affect the health of the bone joints in the body. A painful inflammation of a joint or joints usually produces heat and redness. The condition can be brought about by nerve impairment, decreased or increased function of the endocrine glands or degeneration due to age. So what is the worst Arthritis and what make them worst, find out below. What are the early symptoms of arthritis? The many forms of arthritis can involve symptoms affecting various organs of the body that do not directly involve the joints. Symptoms in some patients can also include non-specific fever, weight fatigue, feeling and loss unwell. The symptoms of arthritis include pain and limited function of joints. The inflammation in the joints is characterized by stiffness of the joint, swelling, redness and warm. Tenderness of the inflamed joints can be present. click to enlarge> Arthritis schema and all different type of Arthritis. Are there different kinds of arthritis? There are just so many different type of arthritis, to be sure, remember to go to your local hospital and have you check out. For example, some people have asked me “does osteoarthritis get worse,can osteoarthritis develop into rheumatoid arthritis”, sadly I do not have such answer. Please go and see your physician instead. Osteoarthritis is an autoimmune disease that disfigures the joints. It is a disease that affects any joints in the body such as hips, knees, feet and spine. Osteoarthritis is the most common form of arthritis caused by the breakdown of cartilage. Bits of cartilage may break off and cause pain and swelling in the joints between bones. Rheumatoid arthritis also causes inflammation of the sheaths around the tendons, the one that join muscles to bones. Rheumatoid arthritis is an autoimmune disease. Normally, the cells called antibodies being produced by the body’s immune system, attack the foreign substances such as viruses and bacteria. With autoimmune diseases, the immune system mistakes the person’s own tissue as foreign and attacks it. With rheumatoid arthritis, the antibodies attack the membranes around the joints that cause swelling, pain and stiffness. In some cases, rheumatoid arthritis can cause deformity. 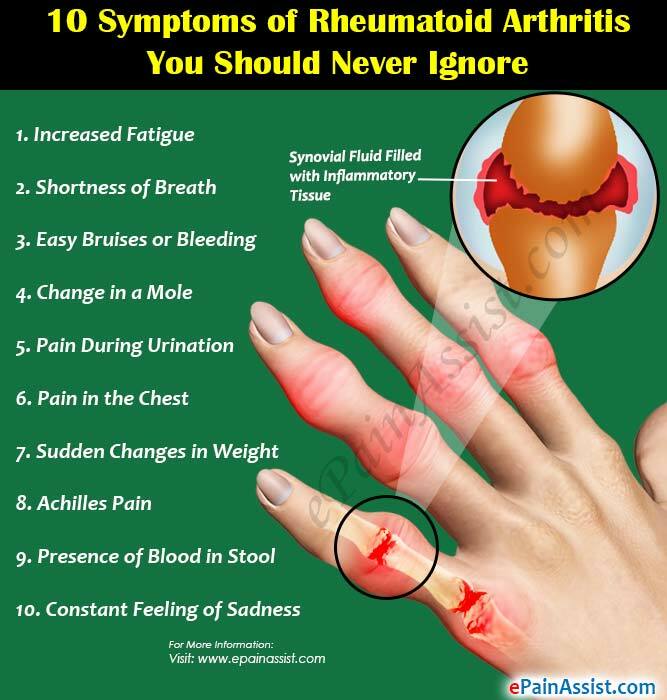 via: This is the 10 unusual symptoms of rheumatoid arthritis. Juvenile rheumatoid arthritis is the type of arthritis that causes joint inflammation and stiffness for more than six weeks in a child of sixteen years of age or less. There are three types of juvenile rheumatoid arthritis, the polyarticular, systematic and pauciarticular. Polyarticular involves more than five joints and may be associated with a low-grade fever. The pauciarticular involves fewer joints and the systematic juvenile rheumatoid arthritis can affect the entire body. Arthropathic psoriasis, also known as psoriatic arthritis, is a rare type of Arthritis involving chronic skin scaling and finger nail changes, just like the psoriasis disease. Some people with arthropathic psoriasis experiences arthritis symptoms in the back and spine. People experience this type of arthritis can be called psoriatic arthritis mutilans. This is where the disease destroys the bones and joints, leaving patients with club-like and gnarled hands and feet. In many patients, symptoms of psoriasis precede the arthritis symptoms; a clue to possible joint disease is pitting and other changes in the fingernails. Both the skin and joint symptoms will go and come; there is no clear relationship between the severity of the psoriasis symptoms and arthritis pain at any given time. via: arthritis mutilans early symptoms in a 39 years old lady patient. The study explains that osteoarthritis arthritis attacks more in older people. Patients commonly get arthritis in several ways. When it comes to triggering arthritis, doctors have implied that a hereditary issue has a lesser percentage of risk. Some types of arthritis have a strong link with genetics. These are arthritis in the spine and gouty arthritis. Most causes of arthritis include things like sports injuries, old age, joint overuse, and other personal risks. Arthritis has affected so many American. It is important to know the symptoms early so that you can avoid having to deal with the painful discovery and irreversible problem with your joint. In case you want to learn more, remember to check out https://cabracelet.com/blog regularly for an updated resource on this painful disease.